What is more wonderful than the outpouring of Jesus' Blood from His Sacred Heart. That Precious Blood flowed from Our Saviour's Heart to redeem us. He saved the world from sin through this outpouring. The Modern Church has incorporated the feast and made it one with The Feast of Corpus Christi. Yet, there is this Feast, and a precious one at that. We should know that The Body and Blood of Jesus Christ is one, but also separate. But they are still, and should be recognized as such. St Gaspar, who is known for being devoted to The Precious Blood of Christ and as preaching to many missionaries on this particular feast shows us just how important it is to remember the Blood that Poured from His Precious Body. 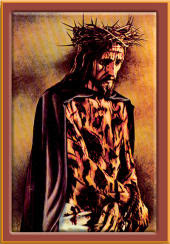 Remember how this Precious Blod was shed, through the Scourging, Crowning and through His Crucifixion. There are prayers and devotions to The Precious Blood and let us continue to not forget this Feast and what it stands for, and revealed through The Sacred Heart.